If you're looking for an all-around solid pair of headphones you can use whether you're editing videos or listening to music on the bus, these should be on your shortlist. This post was updated on April 1, 2019 to reflect changes in pricing and pertinent information. 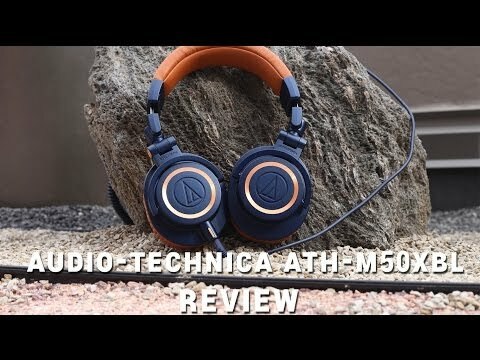 Audio-Technica is one of those companies that has earned the respect of the audio world, but their most popular product by far has to be the ATH-M50x headphones. These headphones basically went viral a few years ago and, as is the case with all great headphones that have a 3.5mm connector, are still going strong. But what is it about these headphones that make them so good for just around everyone? Let’s find out. The ATH-M50x headphones come with a few extra accessories in the box so you can get the most out of them in a few different situations. In the box, you’ll find the usual suspects like a soft carrying pouch for when you’re traveling and a ¼” to 3.5mm adapter for when you’re plugging into equipment, but you also get three different kinds of audio cables. Two cables are six feet in length, one of them being a straight cable and one being coiled. The third cable is a standard 3-foot straight cable for when you’re on the go and just want to plug into the phone in your pocket. Of course, all cables have the proprietary Audio-Technica connector, so try not to break or lose them or you’ll need to purchase another from Audio-Technica. Students and commuters. If you’re always on the bus or train, the plush padding and closed-back design do a decent job at blocking outside noise. You’ll also benefit from the folding design as you can toss them in your bag when you get to where you need to be. YouTubers and anyone starting to get into audio production. When these headphones “went viral” it was because of the YouTube community. Whether you’re working with audio for videos or for music production, the ATH-M50x is a great all-around pick. They don’t have as neutral a sound as something like the Sony MDR-7506 (which are an industry staple for audio editing), because of the slight emphasis in the lows and the 1.2m cable you can use these as your everyday headphones as well as your editing ones. The Audio-Technica ATH-M50x are a staple in the audio world. When it comes to the build and design, Audio-Technica hit the nail right on the head with these. They’re stylish enough to stand out but not so flamboyant that they draw everyone’s attention in the way that some of the Beats products do. Since the release, these headphones have also been released in a few different color options ranging from a subtle dark blue and tan leather to stealthy all-black. While there aren’t a plethora of color options, you shouldn’t have a problem finding one that you like. Design aside, these are also a pretty sturdy pair of headphones. The entire build is plastic, so don’t expect anything premium here, but combine the lightweight plastic with the plush padding and these are comfortable to wear for those long listening sessions. The ear cups also rotate 90 degrees so you can have them flat around your neck when not in use, but it also helps with comfort as you can adjust them ever so slightly to get the most comfortable fit. While they’re not as comfortable as something like the Beyerdynamic DT 990 Pro headphones we reviewed with their velour padding, they’re certainly more versatile when it comes to finding a good fit. On the downside, these don’t breathe very well due to the padding so if you’re in a hotter environment you might find that you need to take them off from time to time to avoid sweaty ears. While we had no issues with durability, it’s worth keeping in mind that these are still made of plastic so you might not want to throw a pile of books or a laptop on top of them. These came out before everyone decided that removing the headphone jack a good idea (which it wasn’t), so all three cables that are included in the box have 3.5mm jack at the end. As we mentioned above, it does come with a ¼” adapter so if you have an audio interface or higher end piece of gear you can just screw it on. But it’s worth mentioning that Audio-Technica recently released a wireless version of these, the ATH-M50xBT. And I encourage you to go for that option over the aging ATH-M50x, not simply for the wireless upgrades, but the removal of the cable locking mechanism. By removing this, you can use any old 3.5mm to 3.5mm TRRS cable lying around should yours break. Just keep in mind that as convenient as Bluetooth is, it isn’t perfect and the quality of certain codecs is dependent on whether you’re using an Android or an iOS device. The Audio Tehcnica ATH-M50 is marketed as a monitor headphones, but they’re more like a Swiss Army Knife of audio if you’re going just by the sound performance. They’re definitely more neutral than something like Beats, but there is still a slight emphasis on notes in the lower frequencies that you won’t find on higher-end studio headphones. These headphones sound great when it comes to classical music, especially in the upper frequencies where instruments like strings float between the mids and highs without losing any detail or getting harsh. You might find that because the pads are so shallow, others around you might hear what you’re listening to because the seal is disrupted. This is something that should be mentioned so you are mindful when listening in close quarters. Additionally, as the bass in some songs are a tad on the over-emphasized side, songs like Shook Ones Pt II by Mobb Deep can boost the lows to an almost jarring experience for your liking. I can honestly see why these headphones are rated so highly. The style, comfort, and overall great sound are what makes these headphones a great buy and because they’ve been out for a few years now, the price has dropped even lower making them a better value. During my time with these headphones, I liked them so much that I even purchased some for myself, and I’m sure you won’t regret picking up a pair of these either. That said, if money’s no object, you really should grab the Audio-Technica ATH-M50xBT instead. Not only do they offer the best of both worlds when it comes to mobile and desktop listening, but they offer the same sound the M50 line has earned its fame with. For only $199, you could grab a pair of cans that offer everything the Audio-Technica ATH-M50x does, but with Bluetooth 5 wireless connectivity, and excellent battery life.